The only thing better than how cool this Woven Pigs In A Blanket looks is how great it tastes! 1) Preheat oven to 375 degrees Fahrenheit. Roll out pizza dough into a long rectangle and place on a parchment lined-baking sheet. 2) Using a sharp knife or a pizza cutter, slice pizza dough horizontally into 6 strips. 3) Fold back every other strip. Place 1 hot dog in the center on the flat strips, then fold strips back over the hot dog. 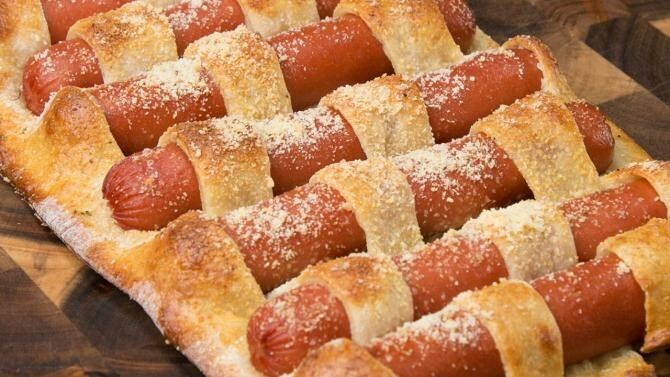 Continue this pattern until all of the hot dogs have been woven into the dough. 4) Pinch together the sides of the dough. Brush dough with egg wash, and sprinkle with garlic powder and parmesan cheese. 5) Bake for 25 minutes, or until dough is browned. Remove from oven and allow to cool for 5 minutes.